I am going to write a review on the movie and I am a person who has never ever read the books, so please respect that I am only reviewing this with no comparison other than to the other films. I saw this film at the midnight premiere and it was PACKED, mainly full of women, but it was true evidence that this film series is massive. The film started with an odd introduction compared to the others, with the tone being set as dramatic and sombre, from the word go. Set in District 13, the film’s main setting is something to behold, the spiraling underground fortress they call home is dimly lit, but not short of rooms, with only two beds though. We are painted this image of the strict laws, the pure war camp of the Rebellion and I felt a little fear as I saw these men and women get truly angry and aggressive during a Captiol TV broadcast, the presence of the war never leaves you, so much so you believe its actually happening around you, with you clinging onto the happy moments in the film. 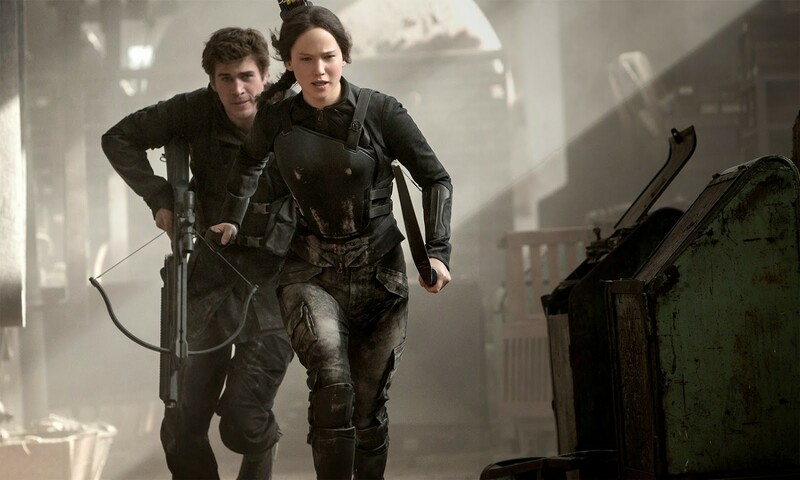 The atmosphere is truly subversive and each trip to the outside world, the defence of a District and the protection of Katniss herself was riddled with intensity, but I feel this is because of the pure lack of action in this film. However, that is not a criticism. This film uses its words to build it’s setting and story, not the big special effects and, lets be honest, we all know the 2nd part is going to blow the roof off the action scale. Although this film told its story through words, it did lack something, and that was a fast pace. Some shots felt too long, overstretched or un-needed, with an odd introduction of a cat into the mix (you’ll see what I mean), this film often felt mix matched and pieced together by an entirely different set of writers. Also one down side is the focus on Jennifer Lawrence herself. I know she IS Katniss and this is her story but I needed some more from the characters, even characters who came into light a little more in this film, like Gale and Primrose, felt overshadowed by the mighty Mockingjay. A film needs more than one of two characters in the focus to really have the depth its needed, in my opinion. The plot, if not a little patchy, was accompanied by some amazing camera shots. Lighting was key to creating this and it was used so well, I was actually impressed with the intensity I felt just looking at the scenes in front of me, they used clever sets and powerful imagery to portray this world under destruction and the harshness of this crumbling dystopia. The fight was evident from every scene and some jumpscares lead to you being on the edge of your seat for at least half of the film. Unlike the last film, the movie didn’t just cut out, you can feel the end of the film coming and the beginning of your wait for the next one. So overall, this film was thoroughly enjoyable, with many questions un-asnwered, I am already hyped for the final film to bring this Rebellion to its climax. However, I must admit, I found the plot patchy, scenes too long and wasted characters. This film is a must see, but for me, it didn’t live up to the hype I had from the last film. What Can You Expect From Game of Thrones Season 5?